Pate is an hors d’oeuvre made of seasoned ground meat, poultry, seafood, or vegetables, mixed with fat and other base ingredients, such as herbs, spices or alcohol. Pate can have a smooth or coarse texture. Pate is often served baked in a crust (en croute) or molded in a terrine. Some Pates are finished with a garnish for flavoring such as chopped nuts. Pate may be served molded or unmolded, hot or cold, but tends to develop its best flavor after being chilled. 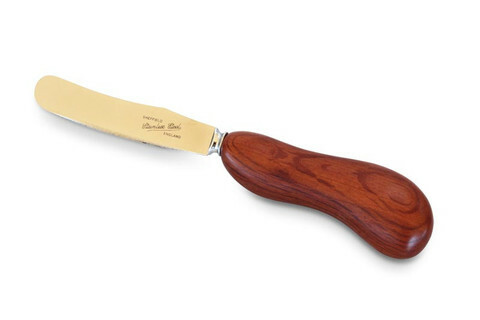 The She-Oak Pâté Knife is ergonomically designed to fit snugly in the hand, allowing a firm grip of the fingers around the handle and though designated as a pate knife it can of course be used for butter, soft cheeses, dips and accompaniments to a cheese board such as quince paste or chutney. The West Australian She-Oak is a highly decorative timber with its definite patterning and colour, shown to good effect in the organic shapes of the handle. The blade is made from the best quality Sheffield steel and the She-Oak Pate Knife makes a great duo on a cheese plate when paired with the She-Oak Cheese Knife. For more go to Australian Woodwork.